Hurricane jova Fizzles, El Banco Comes to Life, Tournament Season Begins! Hurricane jova Fizzles, El Banco Comes to Life, Tournament Season Begins ! We were under a Hurricane watch for what seemed like an eternity but Hurricane Jova passed us without any issues. Not so for Barra Navidad and Manzanillo who are south of Puerto Vallarta by about 150 miles. Now you may ask how this affected fishing in Puerto Vallarta and my answer would have to be favorably! In front of Hurricane Jova we saw every species we look for coming in closer in front of the storm in larger numbers. The report may be a little short this week, but I am sure you understand. We had been watching two hurricanes, Jova and Irwin. Irwin is still spinning around, but is little more than a threat of rain and wind about Mid Mexico now on the west coast. Jova on the other hand had us wondering. Most of the time when Puerto Vallarta is threatened it is a series of tropical storms pushing one in the direction of the Mexican coast. Such was the case with Jova this past week and dominated my blog reports. Jova is gone now, short lived once it hit land. As you would expect we got a fair amount of rain which washed down the mountains of all sorts of organic materials like seeds, leaves, roots, bugs, you name it. Just what ¨they¨ like in the bay and these are the materials that form the trash line we speak so much about at this time of the year. So things have taken off to say the least in the bay these last few days with nice Football sized Tuna and tons of Dorado. Nothing fancy, just find your way on the bay and catch fish. Not much more complicated than that. The Football Yellowfin Tuna are running in the 40lb range, great for eating and the Dorado are in the 25lb range as well, large for the bay. There are also Roballo or Snook just stuffing themselves at the river mouth in dirty water, they don´t care. 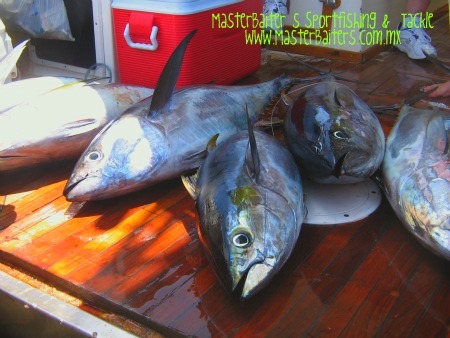 So if you are looking for a short trip, lots of ¨Table¨ fish then you don´t need to go any farther than the bay. Looking for something a little larger in size, then Corbeteña is the place to start looking. With Marlin hovering between the Marietta islands and the Rock, anywhere past the Marietta or El Morro Island is fertile ground for a smaller Blue Marlin. If you find yourself looking for Yellowfin Tuna at the Rock, it turned a little funny out there after the storm. The Yellowfin moved out for a little while, but I am sure this is short lived and will return shortly like they always do. 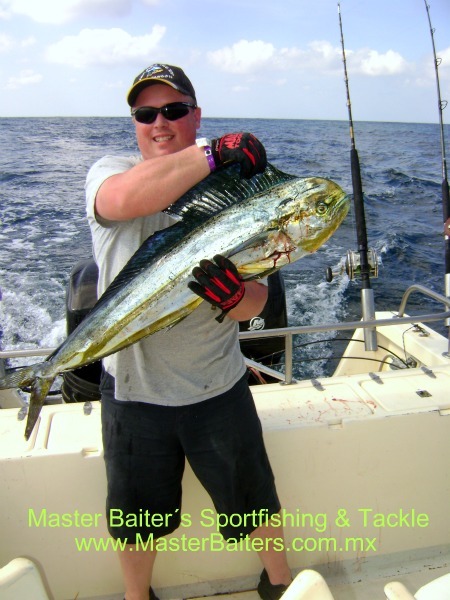 But there are larger Dorado in the 40lb range, Sailfish, Dog Tooth Pargo, aka Cubera Snappers, Marlin and with a little luck Yellowfin Tuna in the next day or so. El Banco has for some reason sprung to life with Yellowfin Tuna, something that has been missing at this normal Yellowfin Tuna Heaven for sure. Sailfish in the Area as well and there is the chance of a Black Marlin for sure. While the Yellowfin Tuna are not Monsters for sure, still at 100 lbs upwards to 200 lbs can be worth your fuel dollar, finally! With plenty of bait in the water it may just pick up enough for the Pez Vela Tournament to be worthwhile this year. The points of Punta Mita and Cabo Corrientes are still smoking with action, Dorado and Sailfish mostly. By the reefs at Punta Mita there is always the chance of Rooster Fish on a shinny lure or live Google Eye. Worth your time and money which ever location you choose to hit. With the port only open a couple of days the sizes of fish are hard to call or predict. We are still waiting to see people heading out to the fishing grounds. As far as sizes go, not enough reports to actually give sizes. But the fishing is happening and in a few days I will have a better feel for what is happening out there. But before the storm as everyone was nervous the fishing exploded as you can expect in the path of a Hurricane or even tropical storm. The trick here is to get your fishing days in as the pressure pushes the game fish in the direction of where you are at. This does not always work, it just depends, but with us here in Puerto Vallarta we found two storms pushing in our direction and that is when if you find yourself in the right place, you can enjoy the benefits as you cross your fingers hoping the Hurricane heads elsewhere. Mexican Footalls, YF Tuna that is, Good Eating! The good news is the water temperatures are holding true even at 84 to 86 degrees with the oncoming of another La Nina year with colder than normal water temperatures circulating enevitable. Plenty of bait and blue water. But we are coming to an end of the rainy season and soon the trash line will be a thing of the past until next year. No worries amigos, fishing will hopefully remain great into January! Until next time, don`t forget to kiss your fish! 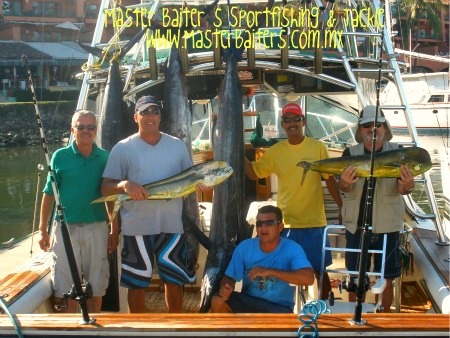 This entry was posted in Big Game Fishing, Deep Sea Fishing, Family Vacations, Fishing, Fishing for Sailfish Fishing, Fishing in Mexico, Fishing Reports Puerto Vallarta, Marina Vallarta, Marlin fishing, Mexico, Mexico fishing, Mexico Tourism, Puerta Vallarta, Puerto Vallarta Sportfishing, Puerto Vallarta tourism guide, Puerto Vallartra Fishing, Puerto Viarta, Sport fishing, Sportfishing Puerto Vallarta, Sports Travel, Travel, Travel Sports, Tuna, Yacht Rental, Yellowfin, Yellowfin Tuna Fishing and tagged Big Game Fishing, Bloody Decks Puerto Vallarta, Cabo Sportfishing, charters, Deep Sea Fishing, Fishing, Fishing Puerto Vallarta, Fishing Tours in Puerto Vallarta, Marlin, Marlin fishing, Mexico, Puerta Viarta, Puerto Vallarta, Puerto Vallarta Bloody Decks, Puerto Vallarta Fishing Reports, Puerto Vallarta Tours, Sailfish, Sportfishing, Sportfishing in Cabo San Lucas, Tours in Puerto Vallarta, Travel, Tuna fishing, Viarta, Yellowfin tuna, Yellowfin Tuna Fishing. Bookmark the permalink.